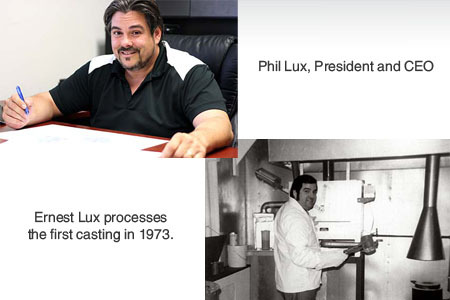 A Master Jeweler and Gemologist, Ernest Lux founded Ace Castings in Montreal, Canada in 1973. As the family owned and operated company grew, they eventually relocated to their current headquarters in Cochester, Vermont, with Ernest retiring and selling the company to his Son and current President, Phil Lux in 1999. Our company now has hundreds of clients spanning the US and abroad. Customer confidentiality remains a hallmark of our company, with non-disclosure agreements being a normal part of our work-flow. We know your business means everything to you, and it means everything to us, as well. We work with our customers closely to protect their innovations and investments. Go Green: We use 100% pure recycled and refined metals.